Hailey Thrasher, a student at Jacksonville University, was awarded an Honorable Mention commendation for her essay in the Whitaker Foundation Art History Fall 2018 Scholarship Program. Her hometown is Anderson, South Carolina. The essay writer was asked to describe the differences in the way watercolor artists Frederic Whitaker and Eileen Monaghan Whitaker approached architecture. 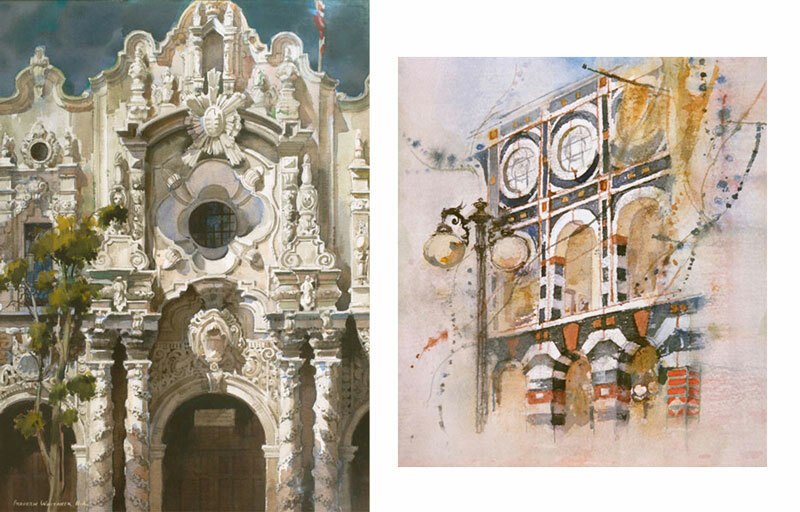 The two watercolors used as examples in the essay question were Frederic Whitaker’s Baroque Façade, 1968 and Eileen Monaghan Whitaker’s Horton Plaza, 1980s. Each artist carves out a certain style for himself over the course of his career that makes his paintings wholly unique. His body of work takes on a distinguishable and iconic style, much the same way that handwriting is entirely unique to every individual. Frederic Whitaker and Eileen Monaghan Whitaker were both known for their paintings of architecture. However, they each approached this subject matter in very different ways. In “Baroque Facade,” Frederic Whitaker takes a very calculated, formalized approach. His color palette is limited, relying mostly on shades of gray, brown, or blue to define his surfaces. He builds his colors slowly, layer upon layer–starting barely more than transparent and gradually building more pigment into the painting. However, through his many layers of watercolor, Frederic Whitaker never loses the hallmark lumosity of the medium. This is indicative of many hours spent honing his skills and knowledge as an artist. Further evidence of his background as an artist is found in his linework. His lines are extremely crisp, and, if one looks closely, one can even make out the faint markings of his linework underneath the watercolors. “Baroque Facade” is a highly detailed, tonal study of light and shadow. With this light and shadow he depicts depth. The viewer is able to distinguish foreground from background. In this space, Frederic Whitaker seems to inject a somber reverence, as if all life ceases simply to worship this structure. Frederic Whitaker takes great care to preserve every painstaking detail of the architecture. Every acanthus leaf, filigree, projection, and recession is captured. The building is large and takes up most of the paper, save for a small tree in front. His choice to make the architecture this prodigious commands respect from the viewer as well. Furthermore, the sky in the background is quite dark and verges on being ominous. This adds not only a unifying theme of color to the piece, but also another indication that this building is larger and more prestigious than human life. Eileen Monaghan Whitaker’s approach in “Horton Plaza” is vastly different. Her piece is less structured, but no less thoughtful. Where her husband studied light and shadow, she examines color and the voice it gives to a painting. She makes her entire painting with mostly primary colors. One can make out her wild uses of cerulean, crimson, and a golden rust. Her vibrant colors bleed together, as do her foreground and background. In her wet-on-wet technique, the viewer discovers a mottling of the aforementioned colors. Dribbles of red, blue, and rust cover the paper in implied lines. She directs the viewer in diagonals across the page, stopping at areas of light and human life. These implied lines suggest movement or activity. Her colors are not the only vibrant part of her painting–so is the atmosphere. Where “Baroque Facade” is devoid of the human form, “Horton Plaza” is teeming with life. One can make out the delicate human forms carefully perched under the archways. Unlike her husband, she places much more importance on the human forms, rather than the structure itself. Her architecture is unhinged from the rest of the work. It floats in the middle of the page with only her abstract splashes of color and a small lamppost to consume the negative space. Her loose brushstrokes imply her painting was conducted hurriedly, as if to preserve a quickly passing moment in history. Frederic Whitaker commands respect, whereas Eileen Monaghan Whitaker invites the viewer to indulge in the great contrast of colors and take in the life that is happening around. “Horton Plaza” is a celebration of the brevity and fullness that is human life.In Frederic Whitaker’s “Baroque Facade” and Eileen Monaghan Whitaker’s “Horton Plaza,” both artists approach architecture as a subject matter. Both artists also use their academic backgrounds to skillfully carry out these paintings. Frederic Whitaker applies his knowledge and skill to carefully depicting the captivating light and shadow and quiet awe for the structure. On the other hand, Eileen Monaghan Whitaker uses her hours of practice and skill to study the deep connection between color and the range of human emotion. She makes full use of her palette with a loose brush to indicate a rushed enthusiasm, as if she is capturing a setting sun. Each artist went to great lengths to push the boundaries of his or her work. Decades later, one is still able to discern the defining characteristics that set Frederic Whitaker’s “Baroque Facade” apart from Eileen Monaghan Whitaker’s “Horton Plaza” as simply and easily as if one was comparing handwriting.